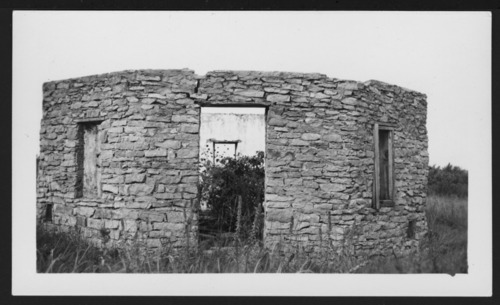 These four black and white photographs show the remains of a stone octagonal house located 1 mile west and 1/2 mile south of Valencia in Shawnee County, Kansas. The structure built in 1911 by R. E. Jones was intended to be used as a chicken house. The two individuals in the fourth photograph have been identified as Charles Darnell and Benny Root. The fourth photograph is dated January 11, 1931.